Financing Available and make sure to grab our limited time coupons below. We are a GAF Factory Certified Master Elite Contractor – a distinction shared by less than 2% of roofers nationwide. As one of the best Orlando roofers, we have won multiple awards for our customer service and product knowledge. Our goal is simple. To provide you with the best roofing products available, at the most competitive prices possible. Your family deserves nothing but the best. We wouldn’t put a shingle on your roof that we wouldn’t put on our own roof. Thankfully, our buying power allows us to provide great products at reasonable prices. For over 25 years, we have serviced the greater Orlando area providing roof repair and roof replacement services to thousands of local homeowners and businesses. We service all of Central Florida including Orange and Seminole Counties. We stand by our Orlando roofing services. Here, we believe that by treating our customers like family, we will provide you a better service experience. We know you have better things to do than to tend to roof problems. That’s why our entire staff takes great pains to assure you don’t have any pains in the process. When you hire us, you aren’t just hiring another roofing contractor, you are partnering with us. We don’t just speak roof, we speak human, and at the end of the day….that’s what really matters. 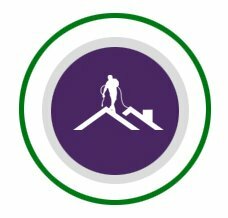 Whether you are in need of a small roof repair or considering a complete re-roof, our service teams are among the best in the industry. We have received the GAF Installation Excellence Award for four years running, including 2013, 2014, 2015 and 2016. When it comes to providing the best installation services, we will happily go up against anyone. When you hire us, you aren’t just hiring another contractor for your roofing project, you are partnering with us. We want to earn your trust and make you a raving fan of our services. We don’t just speak roof, we speak human, and at the end of the day . . . that’s what really matters. So give us a call & we will show you too that your next roofing problem can be fixed with a very simple phone call & a friendly voice answering on the other end, because at roof top services . . .“we keep the rain out and let the sun shine in” . . . that’s our promise to you. GAF Certified Master Elite Contractor – a status that less than 2% of roofing contractors nationwide have achieved. We never sub work out. All work is handled by our qualified staff. No matter the situation, you’ll have superior materials creating the look you want for your roof while we make sure to take care of any problem areas. You’ll have peace of mind knowing your roof is permanently repaired for longevity and looks great as well. We only use the highest quality of GAF roofing materials. Over the last 26 years we have tried many different products and have come to the conclusion that GAF is one of the finest products in the industry. Long-term product warranties, coupled with professional installation services, are always going to be your best bet to enjoy your roof for many years to come. Your roof is an integral part of your home that keeps your family safe. We are a family run business with 26 years in the industry. Working with us to repair or replace your roof means you can leverage our expertise to protect your family. We never use subcontractors, which means you’ll be talking directly to the people doing the repairs at every step in the process. We encourage you to review our reputation online. We are accredited with the BBB, are a member of Angie’s List and Yelp. Please take a look at the recent feedback we have gotten from our customers. Your time is valuable and we understand that your situation may be urgent. We want to work with you to minimize any additional damage to your home and get your roof repaired in a timeframe that is best for you and your family. We make every effort to meet you at your home or business when it is most convenient for you. Our staff is trained to assure you we are able to be as flexible as possible. It’s just one of the small ways Roof Top Services of Central Florida, Inc. works hard to differentiate itself from the competition. When your roof is being repaired or reroofed, a lot of debris will fall into your yard, including rusty roofing nails. We make every effort to clean up after ourselves because we don’t want your loved ones or pets injuring themselves on debris left behind. One of the unique tools we use is a magnetic nail trap that we will run across your yard like a lawnmower. This allows us to pick up any nails potentially left behind. 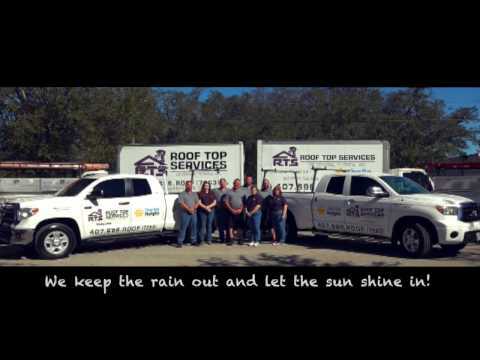 This is just one of the ways Roof Top Services of Central Florida, Inc. works hard to care for you. Yard “Extreme clean” guarantee after we leave. Forms of Payment Accepted: Cash, Check, and all Major Credit Cards.